This is the free weekly edition. 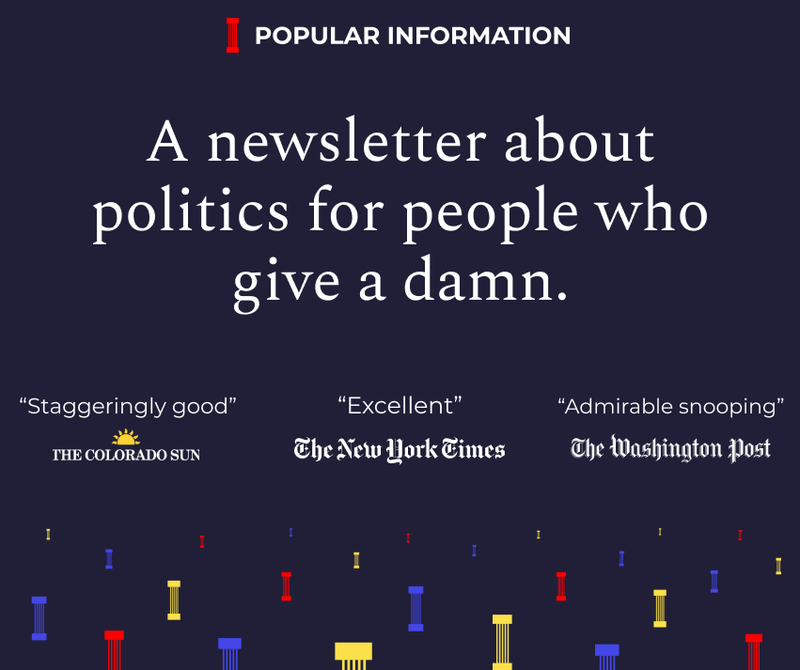 To receive Popular Information four days a week, subscribe for $6 per month or $50 for an entire year. Send tips, ideas and feedback to judd@popular.info. Ian David Long walked into a crowded bar in Thousand Oaks, California on November 7 and gunned down 12 people before taking his own life. Five days later, the mass murder has mostly faded from the national consciousness. Google Trends data shows that search interest in the Thousand Oaks shooting, which reflects the level of media coverage, is already approaching zero. Americans, it seems, are growing numb to mass shootings. The massacre at Tree of Life synagogue on October 27, which left 11 dead, also faded from the headlines within a few days. This indifference may reflect increasing cynicism about America’s ability to stem the tide of gun violence. Mass shootings, while drawing public attention to the problem, represent only a small fraction of gun-related deaths in the United States. The Gun Violence Archive, a non-profit that tracks gun violence, estimates that 12,588 people have been killed by guns in 2018. The data does not include gun suicides. The United States, according to data from 2016, has more deaths from gun violence than every country in the world except Brazil. The gun-related murder rate in the U.S. is 25 times higher than other developed countries. The shooting that left 17 people dead at Marjory Stoneman Douglas High School in Parkland, Florida on February 14, 2017, was different. After the Parkland shooting, a group of students was able to keep the massacre front and center for months. There was hope that the Parkland shooting and the powerful advocacy of the school’s students would change the politics of gun violence. No longer would politicians be able to lay low and wait for things to blow over. There was a new movement demanding action. But after Parkland, little has changed. The question is: Why? One theory is that Americans don’t want to see any legislative action to reduce gun violence. If most Americans align themselves with the NRA, which opposes virtually all gun regulation, it’s not surprising that nothing has been done. Americans, in overwhelming numbers, support aggressive action to reduce gun violence. There is a yawning gap, however, between the American people and even the most progressive politicians. Nearly all politicians who support gun control support a more modest “common sense” approach. A poll by Guns Down America, a gun control advocacy group, found that 67% of Americans support stricter gun laws. More striking is that overwhelming majorities, including a majority of Republicans, support positions considered out of the mainstream. This includes support for requiring a license to purchase a handgun (89%), a limit on monthly gun purchases (80%), and a voluntary government gun buyback program (79%). These are all provisions that, taken together, could reduce the number of guns in circulation. The poll found that advocating for fewer guns in America, something virtually no politician talks about, is a popular political message. There is also strong support for background checks (94%), and a ban on semi-automatic weapons (78%), which many politicians do support. “Background checks are intended to screen out prohibited individuals, and serve as the foundation upon which other gun laws are built, but they may not be sufficient on their own to decrease gun homicides,” the study’s authors concluded. This suggests that universal background checks, the policy which has historically had the most support in Congress, is ineffective as a stand-alone measure. Licensing laws generally require the purchaser to submit fingerprints and involve a background check that is conducted by law enforcement, not the gun seller or dealer. The United States has a lot of mass shootings, in other words, because it has a lot of guns. According to the research, reducing the prevalence of guns might reduce the number of mass shootings in the future. Australia had 13 gun massacres in the 18 years before the gun buyback program and none since. A program identical to Australia’s in the United States would likely run afoul of the Constitution. But nearly 80% of Americans support bold action that is not even being contemplated in the political discourse around guns. Florida is counting votes, just as their laws require, and Republicans are livid. State and national Republicans, including the President of the United States, are making wild charges of voter fraud and other criminal activity. There is no evidence to support these claims. It's a brazen attempt to sully the recount process with two Republicans clinging to small leads. The state's races for Governor and U.S. Senate finished with margins of less than 0.5%. (The race for agriculture commissioner, which is a statewide elected position in Florida, is also below that threshold.) That means a machine recount, in which all the ballots are run through the optical scanners again, is mandatory. If any race has a margin of less than 0.25% at the conclusion of the machine recount, there will be a manual recount. A manual recount focuses on overvotes (where the scanner records more than one selection) and undervotes (where the scanner does not register a selection). Rick Scott (R) currently leads Ben Nelson (D) by just 0.15% in the race for U.S. Senate, so the race appears headed for a manual recount. Andrew Gillum (D) current trails Ron DeSantis (R) by 0.4%, so he'll need to make up some ground to qualify for a manual recount. Scott, the current governor of Florida, claimed that election officials in Broward and Palm Beach counties were violating the law and ordered Florida law enforcement to investigate. "Every Floridian should be concerned there may be rampant fraud happening in both Broward and Palm Beach counties," Scott said. The Florida Department of Law Enforcement quickly announced that they were not investigating because the Department of State had not received any allegations of voter fraud. Before election day, the state sent observers to Broward County to monitor the counting. According to the Florida Division of Elections, those observers saw "no evidence of criminal activity." A New York Times reporter based in Florida noted that Scott "claimed fraud in a county where state observers saw none." None of this has slowed Scott down. "No rag-tag group of liberal activists or lawyers from D.C. will be allowed to steal this election from the voters in the State of Florida," Scott said during an appearance on Fox News Sunday, "Sen. Nelson is clearly trying to commit fraud to try to win this election." Florida Attorney General Pam Bondi, a close ally of Scott, wrote the Florida Department of Law Enforcement Commissioner Rick Swearingen on Sunday night and demanded, again, that he open a criminal investigation into claims of fraud. On Sunday, Scott filed three lawsuits targeting Broward County Supervisor of Elections Brenda Snipes and Palm Beach County Supervisor of Elections Susan Buchner. The first lawsuit alleges that Snipes plans on adding "illegal ballots" to the counties’ vote totals after the Saturday noon deadline. The other two lawsuits call for election equipment and ballots in Broward and Palm Beach counties to be "impounded" when not in use for the machine recount. One suit accuses Snipes of "suspect and unlawful vote-counting practices" and says without an injunction "she will be able to destroy evidence of any errors, accidents, or unlawful conduct." This last part is revealing. Scott has no evidence of unlawful conduct, so he's asking for an injunction to impound all the voting equipment and ballots instead, suggesting they contain evidence of crimes. The absence of evidence of fraud didn't prevent Senator Marco Rubio (R-FL) and President Trump from echoing Scott's claims. The machine recount must be completed by Thursday, November 15. Any manual recounts must be completed two days later, on Saturday. Popular Information will be following the developments closely. This is the free weekly edition of Popular Information. You can subscribe for $6 per month or $50 for an entire year. In return, I'll bring you deep insight into the political news that matters most, four days a week.